Two satellites for Europe's Galileo navigation program are awaiting liftoff Friday on a Soyuz rocket, beginning a campaign to validate the system's accuracy and functionality before completing a 30-satellite constellation later this decade. The in-orbit validation, or IOV, satellites will allow European officials to test Galileo's ability to provide precise positioning, navigation and timing services. Friday's launch will round out a four-satellite fleet of validation vehicles circling 14,400 miles above Earth. Two nearly identical satellites were launched in October 2011 on another Soyuz rocket. "With these two satellites, we are completing a four-satellite system, and we need four satellites in order to validate the functionality of the navigation system," said Eckard Settelmeyer, director of Earth observation at Astrium GmbH of Germany. Astrium GmbH is prime contractor for Galileo's in-orbit validation phase, while Thales Alenia Space of Italy built the 1,543-pound satellites. Astrium Ltd. of the United Kingdom provided the navigation payloads. According to Settelmeyer, engineers will complete performance assessments of the four satellites this winter ahead of the next launch of two Galileo satellites in the spring of 2013. The $7 billion Galileo program is Europe's counterpart to the U.S. Air Force's Global Positioning System. Russia's Glonass network and China's Beidou satellites also provide space-based navigation services. The second pair of Galileo IOV satellites will launch atop a Soyuz 2-1b rocket at 1815:01 GMT (2:15:01 p.m. EDT; 3:15:01 p.m. local time) from the European-run Guiana Space Center on the northeast coast of South America. The 151-foot-tall rocket will propel the satellites to near orbital velocity in less than 10 minutes, then a Fregat-MT upper stage will ignite to inject itself into an elliptical transfer orbit. A second firing of the Fregat-MT stage place the spacecraft in a circular orbit more than 14,400 miles high with an inclination of 55.3 degrees to the equator. The satellites will deploy from a specially-designed dispenser at 2200 GMT (6 p.m. EDT). The Galileo IOV payloads were attached to Soyuz rocket Tuesday, one day after the three-stage rocket rolled to the launch pad from its assembly building. Officials gave the go-ahead for launch during a readiness review Thursday. Friday's launch, which is overseen by commercial launch firm Arianespace, will mark the third flight of a Soyuz rocket from French Guiana. 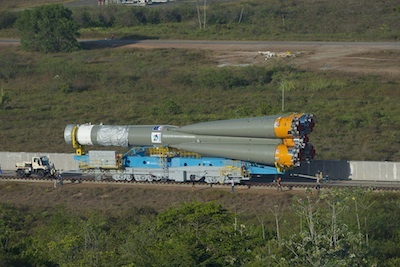 Europe invested $800 million into the Soyuz launch facility at the Guiana Space Center. Russian technicians are based at the space center to oversee assembly and operations of the Soyuz rocket. After the launch, the Galileo satellites will maneuver into position over the next few weeks before beginning validation testing. "We can start, after the successful launch, the validation with four satellites, allowing the program to make the first full-scale positioning tests," said Didier Faivre, director of the Galileo program at the European Space Agency, which acts as the system's prime contractor under oversight of the European Commission, the European Union's executive body. The IOV satellites allow officials to test the concept of the Galileo network before deploying more spacecraft at a regular cadence, according to Paul Flament, Galileo program manager at the European Commission. 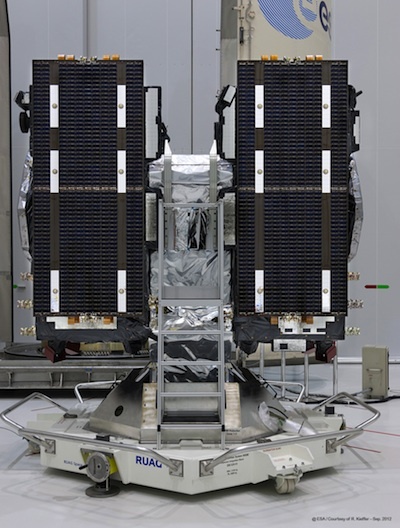 The first pair of 22 full operational capability, or FOC, Galileo satellites will launch next spring. They are built by OHB System AG of Bremen, Germany, with navigation payloads from Surrey Satellite Technology Ltd. of the United Kingdom. OHB System's CEO Marco Fuchs said in September the first Galileo FOC satellite finished assembly in April and was undergoing testing. Construction of the next five FOC satellites was also underway, Fuchs said. Including the IOV and FOC purchases, the European Commission has purchased 26 Galileo satellites and has secured launch arrangements for 18 of the craft. The first 18 satellites should be in orbit by the end of 2014, allowing Galileo to begin initial navigation services. "By 2014, you will have receivers that can get their position thanks to Galileo and GPS information," Flament said. "In 2016, we even foresee that receivers based on Galileo only could provide autonomous positioning. Whether that happens in the receiver world is another matter altogether." All the Galileo satellites will launch either two at a time on Soyuz rockets or four at a time on Ariane 5 rockets. In the commission's next budget cycle, which begins in 2014, officials will procure more spare satellites and launch services for the operational platforms still on the ground.